Much as marketers would have you believe otherwise, the development of off-road, heavy equipment is sufficiently mature and there are few genuine new concepts on the market. 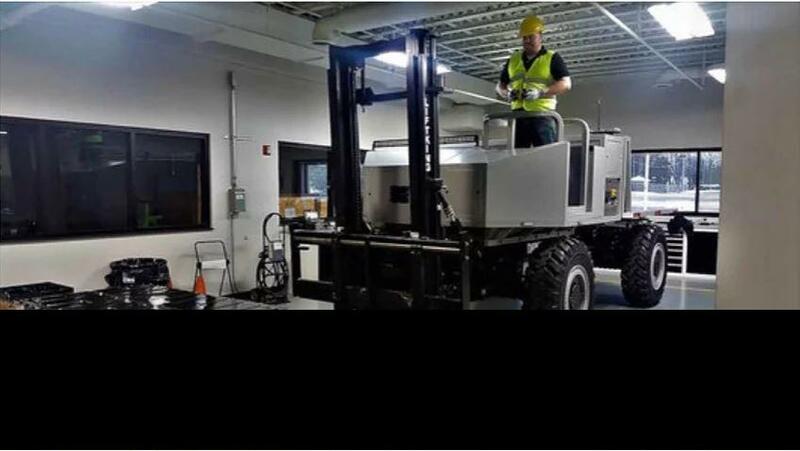 The DANNAR Mobile Power Station (MPS), a combination mobile energy platform and off-road work vehicle, is something that is truly revolutionary, yet it does this by combining existing, proven commercial off-the shelf (COTS) technologies in a new way, rather than reinventing the wheel. Gary Dannar is founder and CEO of DD DANNAR, LLC (DANNAR) and inventor of the MPS. He has a long history of innovation in both the automotive and heavy equipment industries, starting with rough terrain forklift patents in the 1970s and including a stint leading the product development at New Holland of their innovative vertical lift skid steers. He also owns an award-winning roadside mowing system manufacturing company called Little Roadside Management, LLC, which has exclusive distribution agreements with Caterpillar and AGCO Inc. When Gary Dannar spoke to Inside Construction recently, he emphasized that the MPS is not another electric vehicle, although it does use electric propulsion. It carries significant onboard energy storage and can both store energy supplied by a number of sources (e.g. the grid, solar and wind renewables, a generator, or another electric vehicle) and supply clean three-phrase power to buildings, neighborhoods, the grid and to other electric vehicles. In addition to this, it can function as day-to-day work vehicle. With four-wheel-drive and both coordinated and crab steering, plus over 900mm of ground clearance, the MPS can work in virtually any environment, even deep water. With the ability to be a ZEV (Zero Emission Vehicle), the environments include underground transit, mining, indoors and noise sensitive areas. A selling point, differentiated from comparable work machines, is the almost universal configurability on either end of the energy platform. For example, there are lift arms at one end with a 3175kg lift capacity and a universal attachment hitch that accepts most standard Caterpillar, Bobcat and John Deere attachments; and a dump bed or scissor lift on the opposite end. The MPS also has a hydraulic tool circuit for use with most hydraulic tools, including chainsaws, breakers, and impact wrenches. On top of this, there is a very useful 45,000kg towing capacity and the battery power to allow the MPS to work for full day on a single charge. The base model comes standard with two 33kWh BMW i3 lithium-polymer battery packs, but can scale up to four additional packs, which can be added to meet larger power demands. A 60kW Cummins generator with 190-liter fuel tank is also an option. Other proven components used in the MPS include Dana planetary axles, UQM electric traction motors and Parker Hannifin hydraulics. The modular approach extends to operation; the MPS can be remotely controlled or operated from either an open or enclosed cab, with Dana saying that “modern drive-by-wire technology makes these options feasible.” The remote-control feature is especially helpful when the operator’s safety is a consideration. The operator, always on site with the MPS, has that choice. Target markets are councils and utilities, where the MPS can be a daily work tool but, in event of an emergency or maintenance on a utility, the MPS can be used as a back-up power source, supplanting the need for a generator. Scaling up, the MPS can operate on its own or coupled to other MPSs where greater back-up power is required. At present, the MPS is only offered in the US, but its modular construction means that it could be readily configured to other markets with different power requirements, with licensed manufacture as an option. The MPS responds to a need that has been identified by the market for some time, but for which there has until now not been a viable solution. Dana envisages that as the market matures, the MPS concept will develop into a range of machines.